Boomerang buyers on the move? 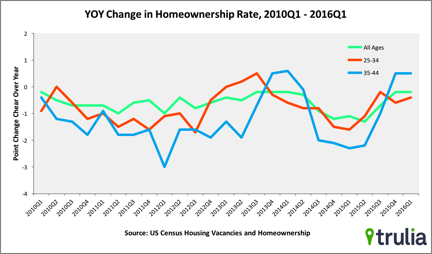 The U.S. Census Bureau released its homeownership and vacancy rate data for the first quarter of 2016. While homeownership remains relatively stagnant, Gen Xers may be re-entering the market at a higher pace in their recovery from the housing bust. While the overall homeownership rate is effectively flattening, Gen. X owners continue to see year-over-year gains, new data from the U.S. Census Bureau shows. According to the most recent Census housing and vacancy survey, households aged 35 to 44 increased their homeownership rate by 0.5 percentage points, moving from 58.4 percent in the first quarter of 2015 to 58.9 percent at the start of 2016. This marks the second consecutive quarter of growth year-over-year for this generation. Households aged 35 to 44 increased their homeownership rate by 0.5 percentage points. Meanwhile, over the same period, the rate across populations declined slightly from 63.7 to 63.5 percent — a 0.02 point decrease that doesn’t indicate significant change. “This is important as many Gen Xers lost their homes during the recession, so this is a cautiously optimistic sign that we may be seeing boomerang buyers coming back into homeownership,” said Trulia’s Chief Economist, Ralph B. McLaughlin, Ph.D., in an email. Boomerang buyers are defined as those individuals who are ready to purchase a home again after losing a property to foreclosure. ‘Boomerang buyers’ are those individuals ready to buy again after foreclosure. Before you’re considered eligible for another mortgage, lenders require seven years of credit building post-foreclosure (and four years of financial repair after short sales). Last year, the first wave of buyers began to reach this recovery threshold, a phenomenon that is expected to reach its pinnacle in 2018. Standard errors for quarterly homeownership rates by age of householder generally are 0.5 percent. The Hispanic homeownership rate experienced a more than 1 percent year-over-year increase, from 44.1 percent in Q1 2015 to 45.3 percent in Q1 2016. The rise in Hispanic homeownership has been tied to the demographic’s surge in purchasing power, entrepreneurial drive and significant income gains. The homeownership rate for households with family income greater than or equal to the median family income stood at 78.1 percent in the first quarter of this year, while the rate for households with family income less than the median family income was 48.9 percent. Both numbers did not represent statistically significant year-over-year changes. The Midwest had the highest first quarter 2016 homeownership rate (68.9 percent), and the West had the lowest (58.7 percent). The national vacancy rate dropped by 0.1 percentage point year-over-year to 7.0 percent for rentals in the first quarter of 2016. The homeowner vacancy rate this past quarter came in at 1.7 percent, a decline of 0.2 percentage points over the course of the year.